Fig. 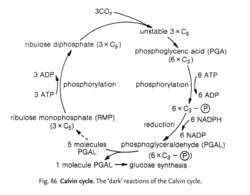 86 Calvin cycle . The ‘dark’ reactions of the Calvin cycle. a series of chemical reactions, first described by Melvin CALVIN, which take place in the watery matrix of CHLOROPLASTS, where carbon dioxide is incorporated into more complex molecules and eventually carbohydrate. Energy for the reactions is supplied by ATP with NADPH (see NADP acting as a reducing agent, both having been produced in the light reactions of PHOTOSYNTHESIS. Since light is not required for the Calvin cycle to continue (provided CO2 ,ATP and NADPH are present) the steps are called the ‘dark’ reactions. Every turn of the cycle fixes one molecule of carbon dioxide by producing two molecules of PGA and then two molecules of PGAL; three turns are necessary to release one molecule of PGAL (C3) for the glucose pathway with the remaining five PGAL molecules remaining within the cycle. Thus six turns produce sufficient quantities of PGAL for the production of one molecule of glucose (C3 + C3 = C6). VOLLEYBALL: Belgian champions Noliko Maaseik have offered Scotland and GB cap Andy Benson a short-term deal. Andy Benson, a forecaster for the Met Office, said it looked like the fog would not clear until tomorrow. Chaired by its senior member, CAPT Carl Bright, the initial group consists of Captains Chris Barber, Andy Benson, Rob Bianchi, Marty Brown, Kathleen Dussault, Mark Heinrich, Fred Kuhm, Bob (Knob) Moses, Eric Myhre, Sharon Redpath and Walt Wright. VOLLEYBALL: Belgian champions Noliko Maaseik, finalists in last season's European Cup, have offered Scotland and GB international Andy Benson a short-term contract. Database won 3-2 at home to Mersey Lions with goals from Andy Dickinson, Andy Benson and Richie Peters, and efforts from Ian Wilson, Frank Fawcett and Mark Bibby helped Endbutt Hotel to move up the table after beating Wynstay 3-1. Andy Benson, corporate manager at the Birmingham corporate banking centre, said: "We were aware of Pitchcare's outstanding reputation within the industry and its proposed alliance with ALS looked to strengthen the offering to their customers even more. VOLLEYBALL: Five Scots have been named in the Britain's squad for Saturday's challenge international against Egypt at Sheffield - Paul Glissov, Andy Benson, Jonny Herley, Mark McGivern and Chris Lamont. With 30 years experience in the banking industry, Steven Pamely joins to head up the team as senior corporate manager, while andy Benson is promoted to corporate manager.